The Atlantic County Prosecutors Office issued a statement regarding simple assault charges against Baltimore Ravens running back Raymell M. "Ray" Rice. According to the complaint in Atlantic City Municipal Court, Rice was charged with simple assault after causing bodily injury to his fiancé Janay Palmer, specifically after striking her with his hand rendering her unconscious at the Revel Casino in Atlantic City on February 15, 2014. 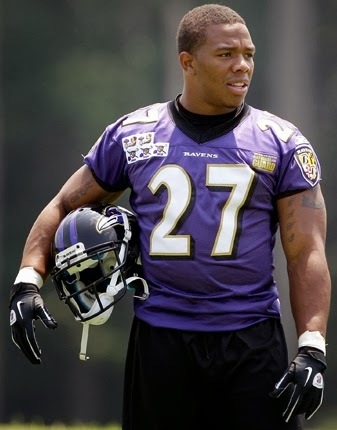 "The domestic violence incident in Atlantic City involving Ray Rice has been referred to the Atlantic County Prosecutor’s Office for review" stated Haleigh Walz, Public Information Officer for the Atlantic County Prosecutor's Office. "The Atlantic City Police Department has requested the Prosecutor’s Office review the case to ensure all appropriate charges are considered. The matter remains under investigation by the Atlantic County Prosecutor’s Office in conjunction with the Atlantic City Police Department. At the present time, Mr. Rice remains charged with simple assault, a disorderly persons offense" said Walz. The Prosecutor’s Office indicated they had no further comments at this time and no interviews would be granted. Video footage obtained by TMZ appears to show Rice dragging his fiancé off the elevator when he is approached by another individual who appears to be security.